• For quantitative fluorescent immunoenzymatic assay of ERK1/2 phosphorylation status in cultured cells. • Simple and convenient. Total and pERK can be measured in the same sample. • The mitogen-activated protein kinase (MAPK/ERK) pathway plays a key role in cell proliferation, differentiation and migration. Stimulation by mitogens eventually leads to phosphorylation of ERK1 (T202/Y204) and ERK2 (T185/Y187). The MAPK/ERK cascade presents many interesting drug targets for the development of cancer therapies. BioAssay Systems cell-based ELISA measures dually phosphorylated ERK1/2 in whole cells and normalizes the signal to the total protein content. This simple and efficient assay eliminates the need for cell lysate preparation and can be used to study kinase signaling and the effects of kinase inhibitors on cells. In this assay, cells are grown in 96-well plates and treated with ligands or drugs. Cells are then fixed and permeabilized in the wells. 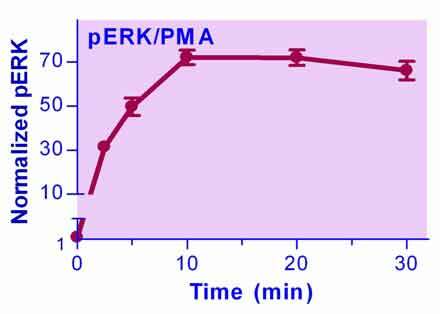 ERK1/2 phosphorylation (pERK) using a fluorescent ELISA followed by total protein measurement in each well.